Rev. Shirley A. Craig, 82, of Russellville, died Tuesday, August 14, 2018, at Conway Regional Medical Center in Conway. The daughter of James and Parthenia (Walraven) Coleman, she was born March 5, 1936, in Russellville. She was a 1953 graduate of Russellville High School. Shirley was a music teacher and mastered a variety of instruments. She also enjoyed giving private lessons. 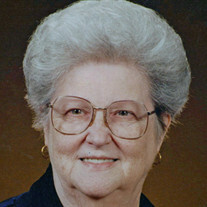 "Sister Craig" as she was affectionately known among her faith community, was a minister with the Arkansas District of the Assemblies of God and served as the Interim Pastor at Perryville First Assembly of God following her husband's death, state pianist and organist, director of Section 6 women's ministry and a member of the Missionettes. She enjoyed sewing, cooking, cake decorating, and event planning. Shirley was preceded in death by her husband, Rev. John David Craig; her parents; and an aunt and uncle, Rev. Luther and Marie Hankins. She is survived by a son, Michael David Newton Craig of Conway; a daughter, Sheila D'Ann Craig Walker, Kansas City, Missouri; 5 grandchildren, Greyson Parker David Craig, Conway; Victoria Morgan Craig, Little Rock, Tyler David Jones, Mariah Le'Ann Jones, and Jessica Norton Bell all of Kansas City, Missouri; 4 great grandchildren, Brohdi Ryan White, Conway; Lydia Bell, Esther Bell and Kennedy Rai Jones all of Kansas City, Missouri; two sisters-in-law, Ella Mae Craig, Van Buren and Rev. Mary Jo Clouse, Lake Mary, Florida; and a host of nieces and nephews. Funeral Service will be held at 10:00AM, Saturday, August 18, 2018, at Humphrey Chapel. Rev. Larry Moore, Rev. Mike Norberg, and Rev. Randy Craig will officiate. Burial will be at Brearley Cemetery in Dardanelle, by Humphrey Funeral Service. Visitation is 9:00 to 10:00 am, on Saturday, prior to the service. Internet obituary and on-line guest book are available at www.humphreyfuneral.com.